My heart is racing as I write this. It is absolutely NO fun to expose yourself for all you are. But what’s worse is allowing the fear to keep you hidden. Hi. My name is Sarah, and I am a human. I struggle with insecurities, and yes, a racing heart. I wish fear would go back to hell where it belongs. About a month ago, I sat down during worship, pulled out my journal and wrote to Jesus: “I give you my shaky hands.” The words themselves were permanent black shakiness. Since then, I have battled. Truthfully, we’ve all battled; it’s just what life is on earth. Even a conversation with a human has got me nervous; eye contact with an attractive guy in Trader Joe’s has me whipping my head in the opposite direction as quickly as possible. Sitting in the uncomfortable with new people, asking questions while people stare at you, sharing your opinion after staying silent for far too many months—it’s all really, really scary for me right now. Yes. Yes, exactly. Right now, embarrassment just feels like a life or death move, and I’d much rather remain hidden in fear and invisibility. I’d much rather just not make grown up decisions and watch Netflix instead, or sit in beautiful memories of the past instead of fighting to make new ones with people I don’t necessarily want to let inside my overprotective shell. If you’re anything like me—and even if you’re not—chances are you’ve struggled with fear at some point in life. I’d say even at some point this week. And you know what? That’s ok.
1. Fear is really good at deceiving you. Being embarrassed isn’t exactly an enjoyable pastime, I completely get that. But would you rather try and fail and have a good story to tell, or sit inside looking out the rain-streaked window with regret and anxiousness? Fear would tell you that watching life go by is better than actually living. It’s definitely safer, but is it worth it? 2. Fear is really good at making you feel exhausted. Fear wants you to give up. The fight against fear is absolutely draining and exhausting, but please don’t let it get you to the point of giving up. You’re much, much stronger than fear, even when it doesn’t feel like it. Sometimes the best decisions are made when we throw all feelings aside and just take the plunge, ask the question, approach the girl. 3. Fear is really good at making you feel alone. Now you starve the thing. You neglect the friendship fear has offered. You do scary things (which usually turn out to not be so scary in reality). You write blog posts about the exact thing that keeps you hostage, and expose it to people. You’re allowed to embarrass fear. You’re allowed to starve it. Starving fear is pushing through an uncomfortable conversation with a stranger—no matter how many times you stutter. 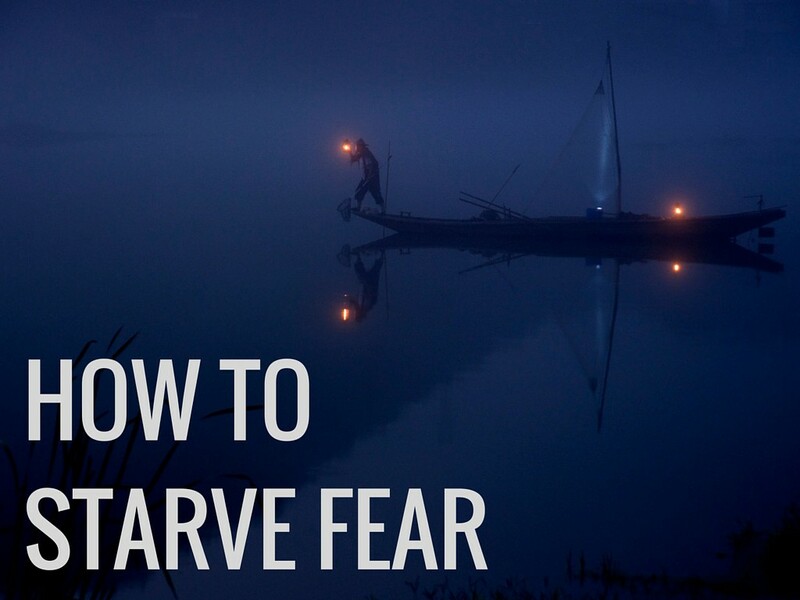 Starving fear is speaking up for yourself, even if you believe you’re not worth it. It’s sharing your heart with people after keeping it contained in high security safety, it’s saying “yes” to a commitment, or “no” to the other three options. It’s walking out your front door and facing the world. It’s choosing to keep going that starves fear. At least that’s what I’m learning. But I’ll let you know if I find out otherwise. What do you think? How have you overcome fear in the past, and what encourages you to keep going? Your blogs are my favorite blogs. I always walk away so encouraged. Susan, thank you, l have always struggled with anxiety, all my life, l would self medicate, by using drugs for over 20 years. By the grace of God, lm sober now, but still struggle with anxiety. I sometimes l wish, l didn’t marry my beautiful wife, who has put up with me for all these years. I going through a season now, that l feel shame because of not working as much as she is. Previous Previous post: Getting Through Pain, Broken Relationships, and Letting Go.